- Two prominent Catholics; an Archbishop and a Cardinal have waged a Super Bowl Bet. The archbishops of Philadelphia and Boston have made this public for Super Bowl LII which will be held on Feb. 4 in Minneapolis. The Super Bowl (American Football Game) is between the Philadelphia Eagles and New England Patriots. 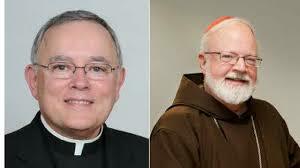 Archbishop Charles J. Chaput of Philadelphia and Cardinal Sean P. O'Malley of Boston, are both longtime friends and classmates from their seminary days as Capuchin Franciscans. They are wagering $100 donations to aid the poor in their archdioceses. If the Eagles win, Cardinal O'Malley will make the donation to St. John's Hospice, which provides emergency services to homeless men in Philadelphia as well as helping them to achieve a stable residence. "In the spirit of friendly competition," the cardinal and the archbishop said in a joint statement Jan. 31, "we have issued our wager because we have confidence in our teams and, more importantly, based on our admiration for the commitment of the Philadelphia Eagles and the New England Patriots to assist their local communities and respond to the needs of the less fortunate. "It is a blessing for the people of Philadelphia and Boston," the prelates said, that Eagles' owner Jeffrey Lurie and Patriots' owner Robert Kraft "have always held service to others as a foundational principle of their personal and professional lives. We pray for a safe and enjoyable Super Bowl for both teams and all spectators, and that the gifts of God's love and peace may bring us closer together as a society."